Mixtures of metallic and semiconducting carbon nanotubes can be separated using chemical 'Scotch Tape', according to an international team of scientists. The cheap and simple technique could lead to improvements in nanoelectronic devices, they say. The electrical characteristics of single-walled carbon nanotubes (SWNTs) make them useful in nanoelectronics. But current technologies produce mixtures of metallic (m-) and semiconducting (s-) SWNTs leading to a decrease in device performance. Now a team led by Jin Zhang at Peking University, in Beijing, China, have developed the chemical equivalent of Scotch Tape. It can be stuck to SWNT samples and then peeled off, taking with it either the m-SWNTs or s-SWNTs, while leaving behind their counterparts. 'The separation mechanism is based on the interaction difference between chemicals and SWNTs of different electrical properties,' explains Zhang. Different functional groups can be used to attract the different SWNTs, thus separating the mixture. The team used soft polydimethylsiloxane (PDMS) as the base material for their tape. To this they attached either 3-aminopropyl-triethoxysilane to make A-Scotch Tape, or triethoxyphenylsilane to make P-Scotch Tape, to introduce amine and phenyl functional groups respectively. By applying each tape to mixed samples of s- and m-SWNTs, and then peeling it away again, the team was able to separate the two types. 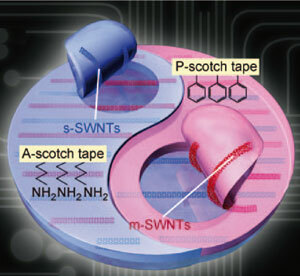 'The A-Scotch Tape selectively removes s-SWNTs, while the P-Scotch Tape adheres to m-SWNTs,' says Zhang. Separating s- and m-SWNTs using this technique is both easy and cheap, he adds. In addition, long and short SWNT systems can be separated and the nanotubes are left undamaged, which is an advance over other techniques. 'The technique is significant as the separation occurs in the dry state, without destroying the nanotubes,' says Esko Kauppinen, an expert in nanomaterials at Helsinki University of Technology, Finland. 'However, there is still an issue of whether the method works with bundled nanotubes - this is important because SWNTs like to form bundles,' he adds. Zhang agrees that there is still work to be done, but says his method could be reproduced in every science lab. 'I believe the technique can promote the separation of SWNTs at an industrial level which is good news for SWNT-based nanoelectronics.' Kauppinen agrees that the method 'could find short term applications, for example, when manufacturing sensors based on SWNT field effect transistors'. In the future Zhang's team hopes to optimise the fabrication of the 'Scotch Tapes' and try other materials to make the process even cheaper.